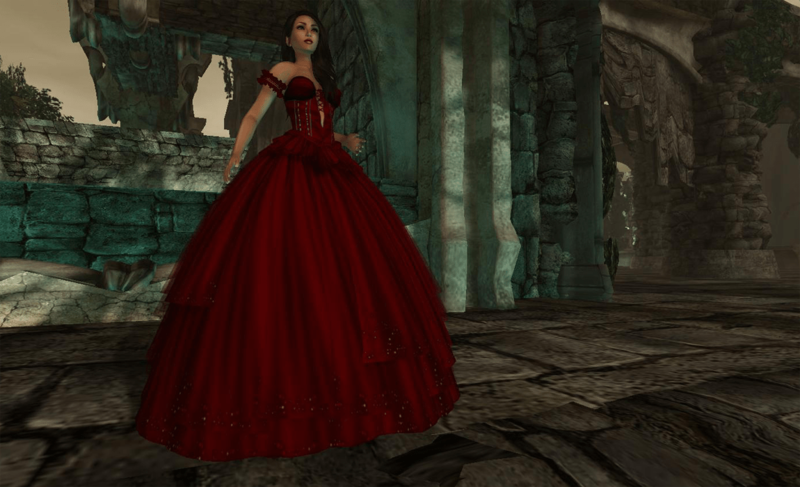 The moment I put on the Blood version of the Mira gown from Kouse’s Sanctum, I was transported ❤ I stopped being Melanie and became a creature of magic and mystery, and I promptly teleported off to the Lost World location to take some Let’s Pretend pictures. I enabled shadows for these shots, so there isn’t any anti-aliasing in the shots but scaling down seems to help with that a bit. I did my own poses for these shots, but I’m not sure if I’ll release them in my store. If you want the poses for yourself, just shoot me an IM and I’ll pass them along! I picked up fri.day‘s freebie ballet sweater a while ago for my alt and I really liked it, so when they held their sale earlier this month I knew I had to get it in black. 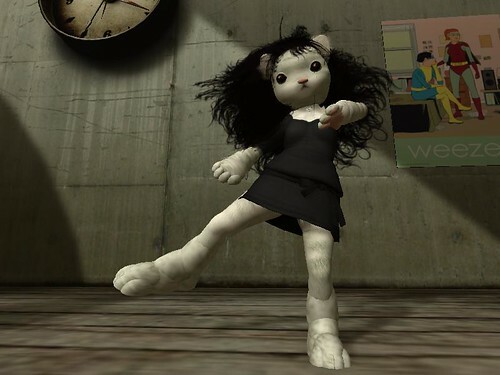 After I put on my new sweater, I decided I wanted to dress my av up as if she were heading to ballet class. ^_^ While doing so, I ended up rediscovering some oldies-but-goodies that still look good. You can click on the images to see larger versions. My Tess hair from LAQ, which works with the hairbase option on my all-time favorite skin, was perfect for this look. I searched for legwarmers in my inventory and unearthed some older BP* “ungry rabbit” legwarmers! These are no longer sold at BP* (hehe, vintage), but the lace versions are still available and Bettie’s got lots of other colorful types available now. I also threw on my Blaze tights (another old favorite) and the cute free flats I recently got at In Her Shoes. addendum: People have been asking where the video was shot. It was shot in my workstudio! I use a KMH skybox, with a couple of walls removed and a deck added. The clock on the wall is a freebie from Chronokit. 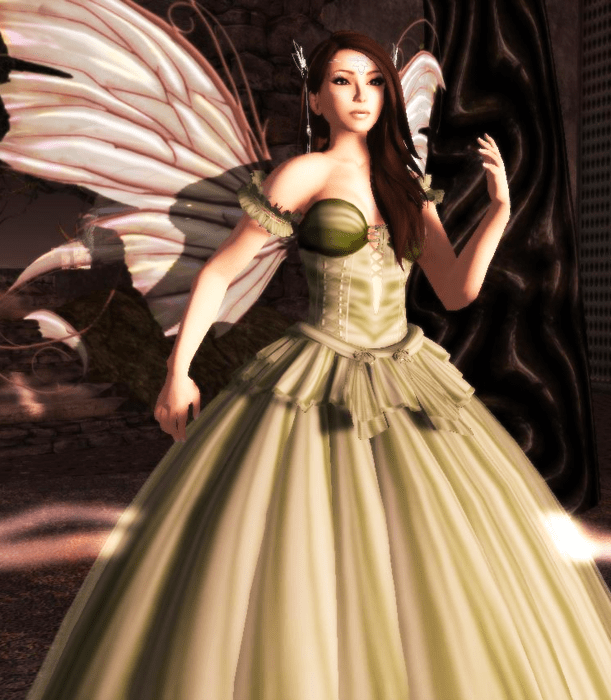 While Violaine Villota of Fancy Fairy is known for her delicate, beautiful fairy wings (both in SL and in RL!) and magical fantasy apparel, she also has really cute hand drawn skins. Her Avalon skins have pleasingly smooth complexions and tones, and feature makeups that come with optional tribal markings to cater to the fantasy market. I’m wearing the Ariel gowns in these pictures, from Kouse’s Sanctum. 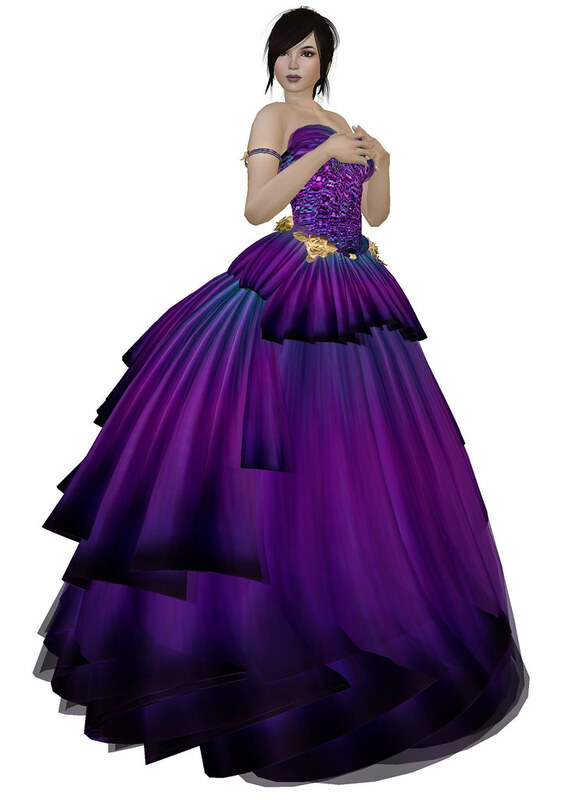 The gowns are featured in the following colors, in this order: aurora, raindrops, flora, ice, and dusk. My favorite part of the Ariel gown is hands down the lush, full flexi skirt that swishes and flares with your every movement. 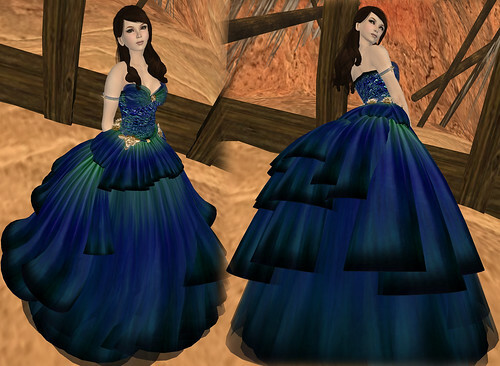 I’m especially partial to the colors on the raindrop and aurora versions of the gown. The gown features sculpted gold roses, which also adorn the included armbands and the prims that adorn the bodice/neckline area.